Amazing Features of the Gulf Stream Gulf Breeze Travel Trailer! The Gulf Stream Gulf Breeze travel trailer is a wonderful way for you to take your next vacation in comfort and with ease. This towable camper is considered an Ultra Lite which means it weighs less than other options, so pulling it with a smaller vehicle like an SUV or a minivan is entirely possible. And with floorplans featuring up to two slideouts, you are sure to find the perfect size for your family. Save thousands on the Gulf Stream Gulf Breeze Travel Trailer! 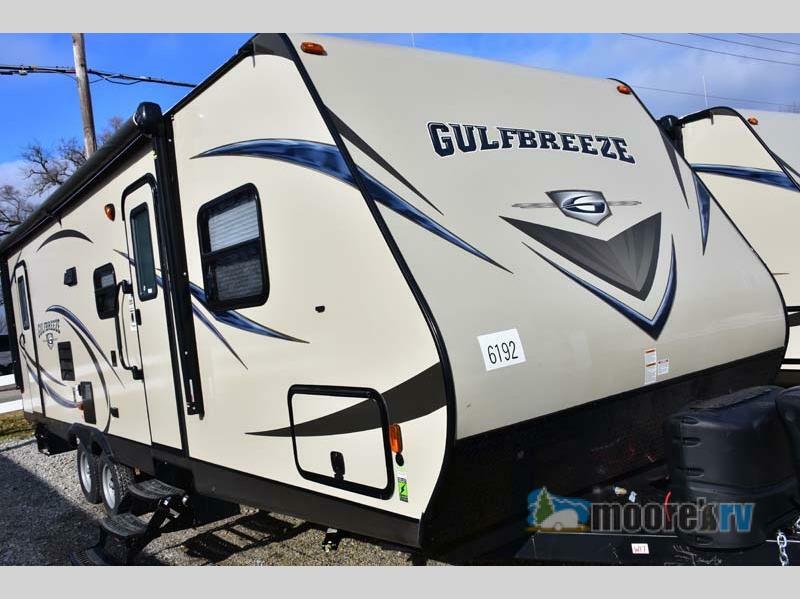 Many people may have the misconception that ultra lite travel trailers are not as well made as some of their heavier counterparts, but as soon as you look at the Gulf Breeze, you will see that it is made with the same quality and care as any other RV on the market. Let’s take a closer look at everything you will get from this incredible camper. Enjoy more time outside with the exterior kitchen! Starting with exterior, you will have many standard pieces as well as optional upgrades if you want to add even more luxury. Every Gulf Stream will come with an exterior awning to create the much needed shade for enjoying the great outdoors, but for a quick upgrade, you can make this awning electric to make set-up and tear-down faster and easier. 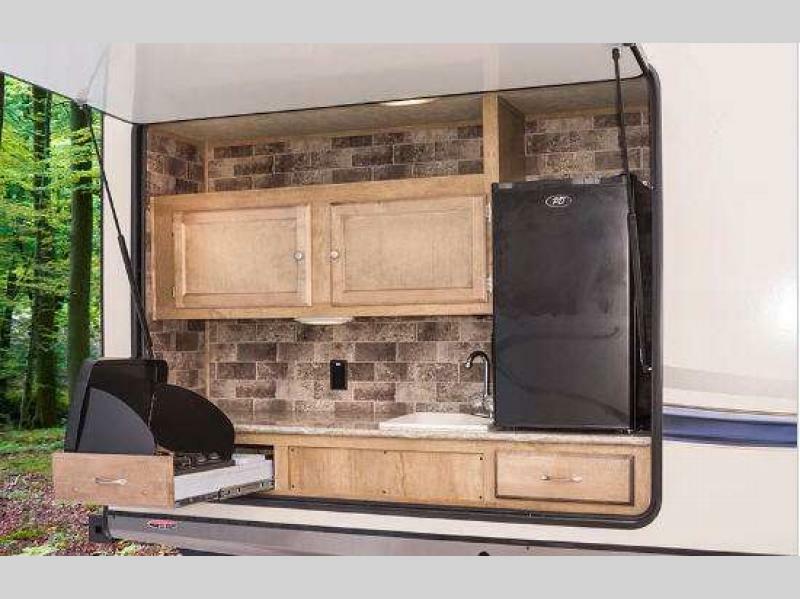 Plus, some models even come with an outside kitchen to give you more ways to enjoy the outdoors. Find luxury standards and add upgrades to make the perfect RV for you. 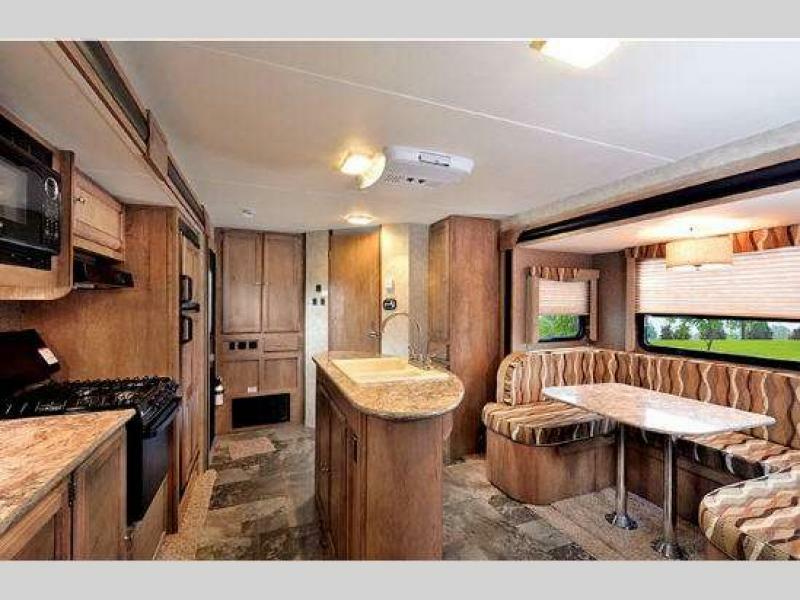 As you step inside this travel trailer, you will see plenty of high quality features. In the main room, you will find not only a full kitchen complete with double door fridge, 3-burner cooktop and range hood, as well as a possible kitchen island, but you will also find the comfortable sitting area with comfy furniture to enjoy watching the television with optional home theater upgrade and fireplace! 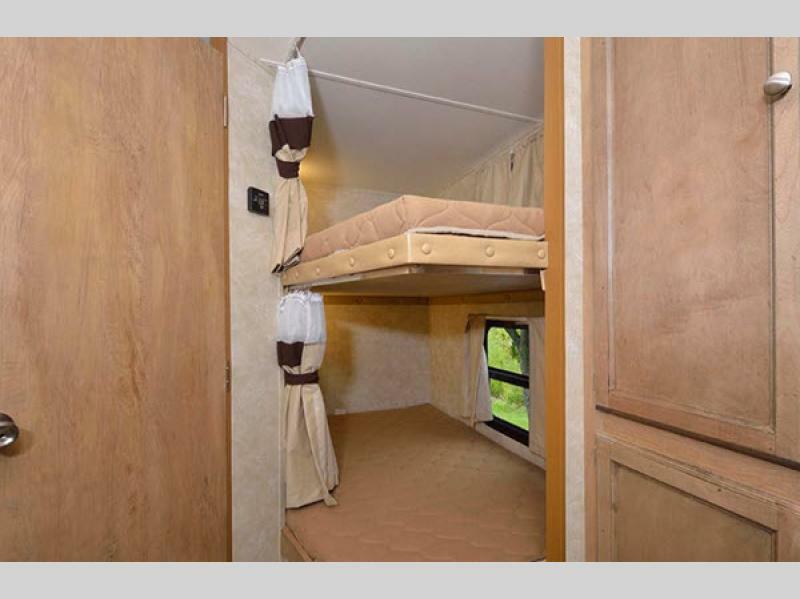 With a queen master and additional bunk beds, everyone will have a comfy place to sleep. You’ll also love the amount of space provided by this Gulf Stream travel trailer. Every floorplan will have a master queen bed with some even featuring a fold-up murphy bed option for additional space. And for large families, feel free to check out the options for bunk beds for even more sleeping space. As you can see, the Gulf Stream Gulf Breeze Ultra Lite has so many amenities that you and your family can enjoy. Contact us to find out everyone about this incredible RV, or just stop on by our location to take a tour of it yourself.